Data from mobile apps promises to give people more power to manage their own healthcare. 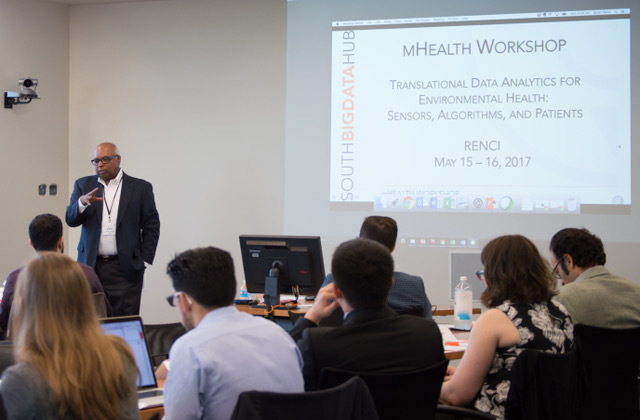 The South Big Data Innovation Hub and the National Consortium for Data Science (NCDS), in collaboration with the Institute for the Future and 10X Collective, held a workshop that brought together a diverse body of experts to identify and prioritize research challenges in data science and IoT cyberinfrastructure. The workshop participants thoughtfully assessed a wide array of mobile health (mHealth) applications to address health disparities and their environmental influences within the research, legal, policy, environment, and clinical settings. Within the clinical setting, participants identified shifting the point of care to the patient using mHealth technologies as a key priority. As health care transitions from traditional clinic-based visits to continuous interactions between the patient and care team, the opportunity exists to create a more patient-centric paradigm of care. Currently, health care systems have a limited view of the patient journey throughout their care experience. Unsurprisingly, care received within the traditional health care system walls is a very small component of the entire patient care journey. Rather, the point of care is largely comprised of behavioral, social, and lifestyle factors or environments. The availability of granular, real-time data from sensors and mHealth devices provides numerous opportunities to increase accessibility to health care services or information, improve quality of care, and the ability to longitudinally track patient behaviors and health care interactions. Creating a continuous feedback loop for patients and their care teams may facilitate creating an ecosystem with the patient in the center. This bi-directional flow of data would allow data generated from patients to be readily available to the care team, as well as making data from providers available to the patient. In addition, patient-generated health data must be integrated and presented in a way that is timely and actionable to the care team. Data standards, including HL7, LOINC and SNOMED, are critical for interoperability between different technologies and health systems to improve care coordination. Also, integrating the assortment of mHealth data sources with electronic health record systems, financial systems, clinical trials, social media sites, and genomic data is vital for informing clinical decisions. Furthermore, providing patients with timely and actionable data, such as personalized educational materials or trends uncovered by their sensor-generated data, is valuable for empowering and engaging patients. They could access their data through a patient portal, mobile app, or other means to track and adhere to care recommendations. In the future, understanding the rich, holistic view of the patient journey will occur largely because of mHealth and sensor data collected outside of the traditional clinical walls. As the volume of digital devices continues to grow, so does the variety and complexity of health information which presents additional privacy, exchange and data reliability challenges. Stakeholder engagement and partnerships are needed to critically evaluate these challenges in order to effectively generate timely interventions and thus shift to a patient-centered paradigm of care. Ashley Griffin is a PhD student in the biomedical and health informatics program at UNC-Chapel Hill. She also works in enterprise analytics at Blue Cross Blue Shield of North Carolina.